Tonight the Baptist church I serve, will gather with our sisters and brothers of Saint Peter Episcopal Church for Ash Wednesday. Ash Wednesday is not normally part of the Baptist tradition and it is beautiful to see these distinct branches of the Christian tree come together for a common purpose. For this ‘liturgically challenged’ Baptist, my spiritual imagination has been enriched and expanded by the addition of Ash Wednesday. In my previous setting, we shared this ritual with a Roman Catholic congregation and now with an Episcopal church. 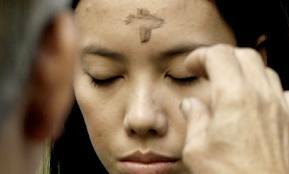 For this ritual, ashes are placed on the forehead in the shape of the cross. The ashes are presented with these words, “Repent and believe in the Good News”. It is a truly intimate act to look someone in the eyes, offering ancient words of repentance, as you smudge their forehead with ashes. You can’t avert your eyes, you can’t deny your vulnerability. In our highly individualistic, youth oriented culture, Ash Wednesday is profoundly counter cultural. This ritual reminds us that we come from dust and to dust we will return. The placing of the ashes on the forehead is a ‘in your face’ reminder that the illusion of our immortality is just that, an illusion. There is something strangely reassuring in acknowledging ones mortality. Something even joyful. Rather than being a morbid ritual, Ash Wednesday reminds us to savor the gift of life, to remember that it is fleeting and that one day each of us will return to our Creator, the source of all that is good, lasting and true. While I didn’t participate in the Ash Wednesday service last night at FBC, I am, for the second year participating in a Lenten fast. This year’s fast will be from desserts and sugar products. Last year I gave up my favorite entertainment, going to thrift stores. I would never have attempted this tradition without Pastor Kent jointly clebrating this time with St. James and talking about Lent at the normal service. It was so spiritually rewarding last year that I was happy to try it again this year. So often we never know what we are missing until we try something new! Thanks, Kent. Thanks Cheryl, may your Lenten journey bring blessing and lead you to bless others. Kent, of the many keeper moments I enjoyed at First Baptist, the annual Ash Wednesday/Pentecost liturgies with St. James were among the very best. I will treasure those memories forever. Thanks for working with their leadership to keep it an ongoing ecumenical faith presence in McMinnville and for those who will benefit from observing that unique and powerful witness to God’s transforming grace. Rob, it was good to share a few of these Ash Wednesday rituals with you. Grace and peace to you and your faith community as you journey through this season of reflection and renewal. A great example of how all of our unique traditions can come together, learn from each other, and share in Christian fellowship. Thanks for sharing!